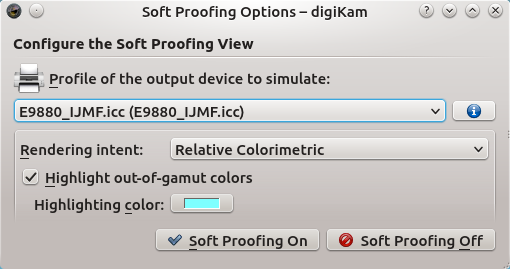 To make this feature work in digiKam, you need to specify color profiles for your display and the output device (e.g., printer). But before you do that, you need to obtain the ICC color profile for your specific printer and print media. Say, you are using an Epson 9880 printer to print photos on the IJMF professional glossy photo paper from Diamond Jet. Grab the appropriate ICC profile from the company’s Resources page. Create the ~/icc directory and move the obtained .icc file into it. In digiKam, choose Settings → Configure digiKam, switch to the Color Management section, and click on the Profiles tab. Select the desired color profile from the Monitor Profile drop-down list (the default sRGB IEC61966-2.1 color profile is a good choice in most cases). Next, in the Color Profiles Repository section, specify the path to the ~/icc directory. Press OK to save the changes and close the dialog window, then restart digiKam. To enable soft proofing, open the photo you want for editing and choose View → Soft Proofing Options. Select the downloaded .icc color profile from the Profile of the output device to simulate drop-down list, then select the desired item from the Rendering intent drop-down list. This should generally be Relative Colorimetric, but if your printer supports only a limited gamut you may want to try the Perceptual rendering intent instead. Enable then the Highlight the out-of-gamut colors option and select the highlighting color you want. Finally, enable soft proofing by pressing the Soft Proofing On button, and you should see the photo exactly as it would appear in print. Thank you so much for your kind words, Phillip!